A simple sales message tells people what you can do for them in a brief and easy way that will gain you more selling opportunities. If you can't simply explain what your sales offer will do for a customer do you really understand what you're selling from a customer's perspective.? Whether you're cold calling a prospect. Presenting to a potential customer. At the Introduction Stage of a sale. Or just chatting with friends. You must have a simple sales message that's easily understood. 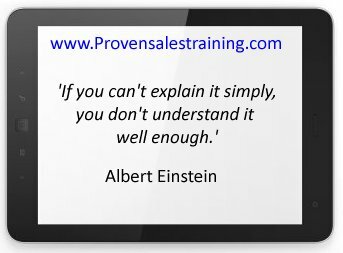 So what's your simple sales message..? Sales roles are not as easy to define as they were a decade ago. Many of us now have multiple roles, self employed sales agents now build there own range of products. Sellers have taken consultative selling to a new level of looking for customer problems to solve, rather than selling a product to meet an obvious need. So describing what you do, and what your products and services can do, for your customers may need some thought to create an effective sales message to grab attention and spread the word. Another obstacle to a simple statement of what a sales person sells, is often that they understand the product but not why a customer would want it. Knowing that the polyurethane bottles your recycling service collects can be turned into clothing won't help you sell it to a customer looking for a cheap waste collection service. Start thinking about what you want to say in a brief message to get the ball rolling about you, your business, and your products. At a recent family gathering I asked a distant relative what the company he had set up actually did. I've met him twice since and I still don't know. I know it's related to the communications industry, but I don't know what he offers or if I would benefit from their services. I may have bought something elsewhere that he could have provided. If I have it's because someone else had a more effective message. If he had used a sales message to tell me what he did I may have come across people that could use his services, but I didn't have a message to pass on. Think of your self as an advert, online, on TV, or in printed media. You are limited for time or space. You don't have enough time or space to tell people everything that you can do for them, which is a good thing really because you would bore them with too much information and lose a lot of friends and potential customers. So you have to pick something about what you do that you can use to explain what it is that you do, what you offer, why people would want to know more. She's very popular, she understands what she does, what she sells, and what it does for the customers. Going back to Einstein's quote: She can explain it simply because she understands what she does well enough. Now tell me, what do you do? While you're thinking about that, take a trip around the Proven Sales Training website to get some inspiration to create your message.